China, 627 C.E. The Tang dynasty’s rule remains tentative after a decade of civil war. The rise of a new uncertainty in the far south thrusts the fledgling dynasty between its most powerful enemies in the north and the possible revolt of the southern aborigines. The emperor and his grand minister delegate a two-man assessment team – the Shaolin Blade, Tanzong and the Imperial Commissioner, Li Wei to travel into the southern regions and negotiate with the aboriginal leader. The first volume of this epic wuxia adventure tale follows the duo to the mysterious Isle of Pearls.To get there, they must use secret Taoist underground waterways, fight off the airborne attacks of the Thunder Lords, cross storm-tossed seas in a shaman’s bronze ship, and then sail aboard the Dragonfly, with the female aboriginal pirate captain, Byung Nhak, as she engages the local warlord, the Iron Shaman and his fleet of Seahawks. Their heroic journey continues into the center of the island through the unexplored “Land of Drifting Ghosts” mountain range in search of a legendary lost Buddhist monastery. While the long hidden Celestial Masters sect of Taoism and an enigmatic Tibetan princess pose an immediate threat, Tanzong’s internal conflicts offer the greater danger. 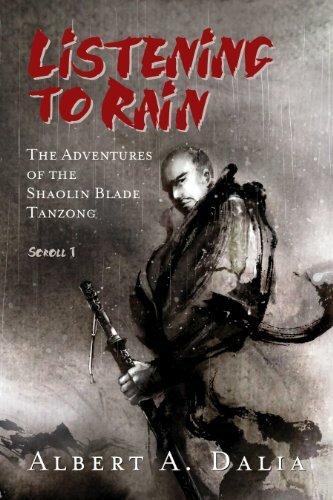 The series, The Adventures of the Shaolin Blade Tanzong, will follow Tanzong’s adventures throughout the medieval Chinese empire. The Wandering Blade website devoted to my writing (Albert A. Dalia), Chinese historical/heroic fantasy, East Asian culture, and the art of storytelling.